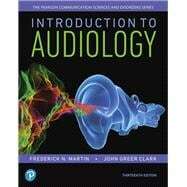 Introduction to Audiology offers a thorough introduction to hearing and balance disorders in a user-friendly format. Extensive pedagogical tools help students better understand, retain, and analyze the material, while the presentation of topics allows instructors to adapt the content to suit their specific teaching goals. The abundance of how-to information, incorporation of current research, and updated learning aids showcase the rewarding and fascinating aspects of a career in audiology today. The Enhanced Pearson eText provides a rich, interactive learning environment designed to improve student mastery of content with links to embedded videos and self-check quizzes with feedback. NOTE: You are purchasing a standalone product; the Enhanced Pearson eText does not come packaged with this content. Students, if interested in purchasing this title with the Enhanced Pearson eText, ask your instructor to confirm the correct package ISBN. Instructors, contact your Pearson rep for more information. Frederick N. Martin, PhD, is the Lillie Hage Jamail Centennial Professor Emeritus in Communication Sciences and Disorders at The University of Texas at Austin. In addition to Introduction to Audiology, he has authored seven books, co-authored another seven, edited thirteen, and co-edited three including texts on pediatric audiology, medical audiology, and audiological counseling. He has written 24 chapters for edited texts, 122 journal articles, 104 convention or conference papers, and 5 CD-ROMs. Dr. Martin was named Professor of the Year by the National Student Speech-Language-Hearing Association for 2002-2003 and is the recipient of numerous additional teaching awards and recognitions including the Career Award in Hearing from the American Academy of Audiology. John Greer Clark, PhD, is a professor and director of audiology education at the University of Cincinnati. A frequent presenter at state, national and international conferences, he has served as a faculty fellow for the Ida Institute in Naerum, Denmark, and a board member of the American Academy of Audiology. Dr. Clark is a past president of the Academy of Rehabilitative Audiology and past chair of the American Board of Audiology. He is the author of over 100 publications including three edited textbooks, a variety of co-edited and co-authored texts (including the popular Counseling-Infused Audiologic Care co-authored with Dr. Kristina English and published by Pearson), two single-authored books, and 17 book chapters. He is the recipient of the Distinguished Achievement Award from the American Academy of Audiology.